Two law firms and a civil rights committee filed a lawsuit monday. 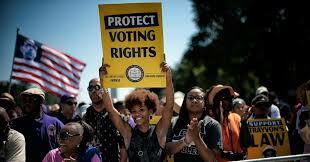 The suit claims black residents have had their voting rights violated, in North Carolina. According to NewsOne: Attorneys from the Washington-based Lawyers’ Committee for Civil Rights Under Law and two private law firms filed the suit…The suit alleges that the black residents who account for about a third of the population in Jones County, N.C., are prevented from electing candidates who represent their needs because the county elects commissioners at large rather than by district. The complaint alleges the at-large system prevents black residents from electing black candidates from their communities, and says the at-large system dilutes black voting power. A black person reportedly has not served on the Jones County board since 1998 and white commissioners have constantly made decisions that benefit whites and disenfranchises blacks.